Whether it be a particular milestone such as silver or golden jubilee, there is something your Priest will enjoy and value here. 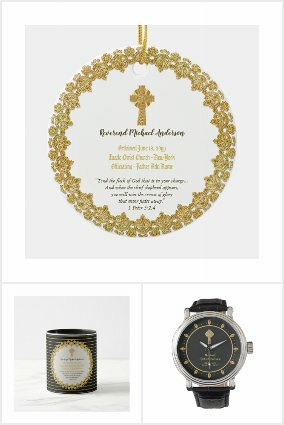 Gifts for Priests available from my Zazzle store include personalized watches, journals, blankets, rosary bead boxes as well as practical stationery items and ornaments. They all have text template fields that can be edited to suit the exact number of years ordained (or other occasion) and space for a name, dates and you can if desired add some scripture, a verse or personal greeting. 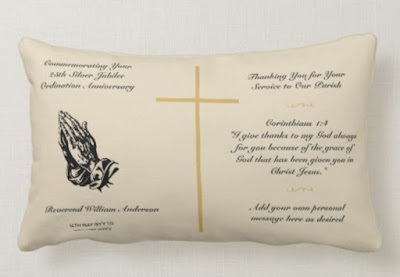 This stylish commemorative ordination anniversary pillow features text template fields that you can edit to add the Bible verse, scripture, quote of your choosing. It has a graphic of hands praying and a gold cross symbol. 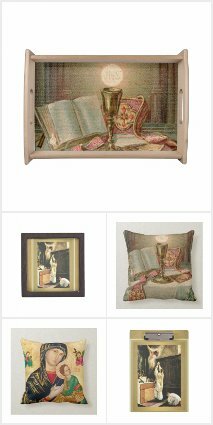 It has a vintage olde world style to it and would look great in the home or office of any Priest. This inexpensive porcelain ornament has decoration on both sides. The front as shown allows you to add commemorative details celebrating your Priest's 10th anniversary of Ordination (it can be changed to ANY ordination milestone) and on the reverse it has a stained glass window graphic which you can replace if desired with a photo or other image. 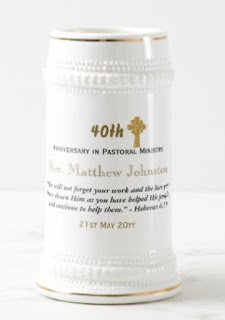 Commemorative mugs are a great idea for Priest ordination anniversary gifts as they can be personalized with the details and remain decorative or put to practical use! This stylish beer stein is an ideal gift choice with it's classic white gold coloring. 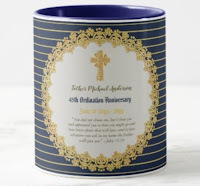 This sapphire blue themed mug is perfect for a 45th anniversary of ordainment with it's classy blue gold coloring and commemorative text fields. Add your Priest's name, the date he was Ordained and the anniversary, milstone years to make this a pratical and elegant gift item. This stained glass print wallclock ticks all the boxes with its religious, decorative and pratical appeal. It will compliment any church setting. There are silver and golden (dial) versions to gift for 25th and 50th Jubilees as required. Add the Priest's name, date and anniversary of ordainment and a personal message. 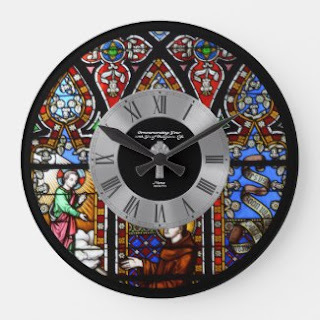 Various stained glass window effect clocks are available for Priest gifts in this store, click on the image to view all. 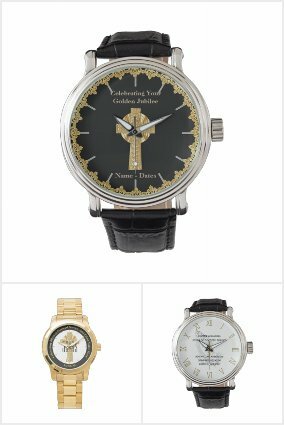 I have created a number of commemorative watches for Priests featuring a cross and other religious images as appropriate.You can choose from many different watch styles when you enter the Zazzle store. They have a wide range to suit all tastes, both modern and vintage. 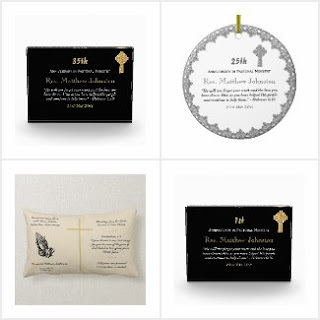 Some are ordination anniversary milestone specific such as 25th and 50th golden Jubilee, but these details can be edited for any ordination anniversary. 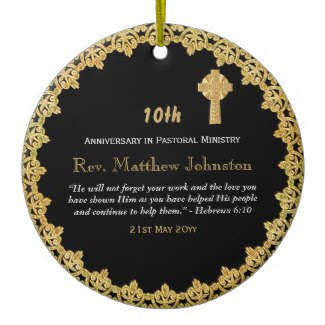 Decorative stained glass themed ornaments are a popular and cost effective choice for a Priest gift and include text commemorating milestone anniversaries, 10th, 15th 25th, 50th (Silver and Golden Jubilee) and more. Both sides of the ornament can be edited. You can add a photo, commemorative message, Bible verse, religious scripture or other as desired to the other side. Priests receive many religious themed gifts each year, including icons, religious art work and verses which they appreciate but which can accumulate. I have read of one Priest who has many storage boxes filled with such gift items. If you want your gift to be seen, enjoyed and not gathering dust in a dark closet, check out this list for inspiration. 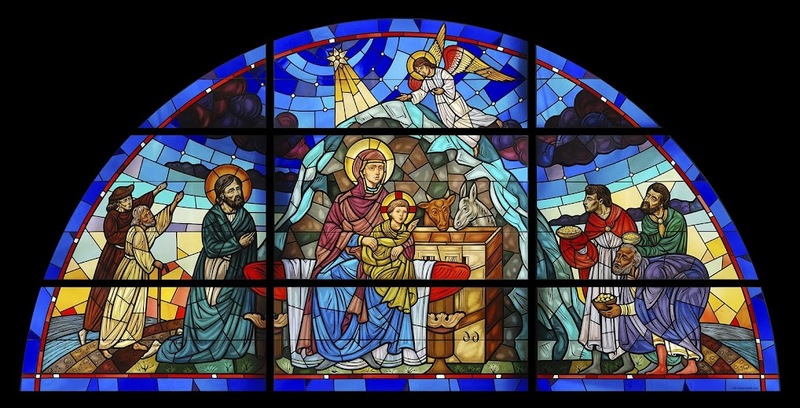 I have my top 5 Gifts For Priest followed by Golden Anniversary of Ordination Gift Ideas and more. Many Priests enjoy keeping a journal, details of sermons, important visits, ceremonies, favorite verses and so on. As such an attractive journal is a practical gift which will be enjoyed. If the journal is personalized with a name, inscription and so on, it has the added value of being a keepsake. This stylish journal has been Handcrafted by artisans in America from cherry wood. It has a natural beeswax finish that highlights the attractive woodgrain. It lies flat when open and has a generous 140 lined pages of archival cotton paper. Personalization Information: The cover may be personalized with a name, personal message, date of celebration etc. If the gift is for a Priest's Golden Jubilee for example you can add the date of ordination and the anniversary date. 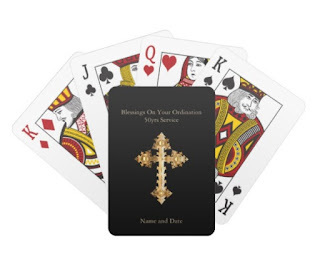 Many Priests enjoy a game of cards and as such a personalized deck is a great idea to commemorate an ordination anniversary. This Priest gift is functional, fun and makes a great keepsake! You can add your own image to the front as well as editing the text template fields. Add a special inscription to commemorate the occasion. A gift card may seem impersonal but it is a great way to allow your Priest to buy something he really wants or needs. They are always appreciated and are less impersonal than giving money. The value varies and you can find something to fit your budget. These can be given via email or sent with an ordination anniversary card. 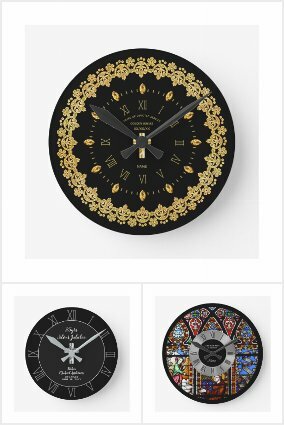 Zazzle has a wonderful range of watches which can be personalized by adding images, text and changing the background colors. Different styles, strap types are available. 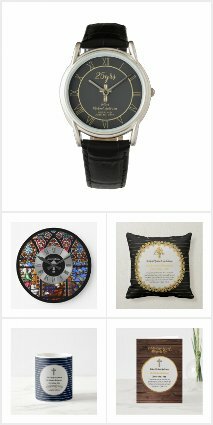 Featured here are a few religious themed watches which may suit a commemorative anniversary of ordination gift. This is a great practical gift, stylish too! Stained Glass Window Jigsaw Puzzle personalized with the silver or golden jubilee ordination anniversary details of your Priest. A fun gift, unusual and a great keepsake! The stained glass window print offers a great challenge to fans of Jigsaw puzzles and there are more in this range. This concludes my top five! Your Priest does have a sense of humor too, so don't be afraid to buy something that is funny. Stay away though from controversial topics which he may find embarrassing. 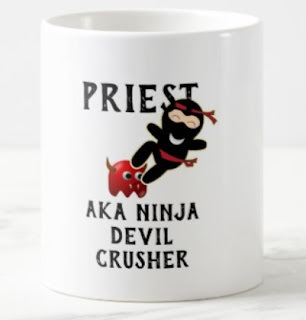 Funny Priest mugs with quotes such as 'keep calm I'm a Priest' or 'Priest by day, Ninja by night', 'This superhero wears robes' are funny Priest mug themes, available via Amazon and Zazzle (Zazzle items can be customized). Funny t-shirts for Priests are also popular with words such as 'World's Coolest Priest' and so on. 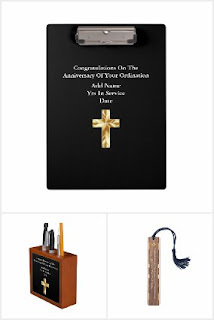 Other suitable gifts for Priests on the 25th, 50th anniversary of their ordination include gift certificates and other items related to his hobbies and interests. If your Priest enjoys music (many do) an iPod, Musical CD or other music themed gift may be appreciated. If your Priest is a bit of an artist and likes to paint in his spare time, how about some art supplies? A nice easel, some paints and brushes etc. Gift ideas for Priests on their 10th 15th 20th anniversaries do not always have to have religious themes. 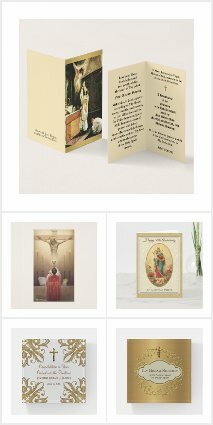 You can gift a religious themed card with your message commemorating the occasion inside that to accompany the gift. 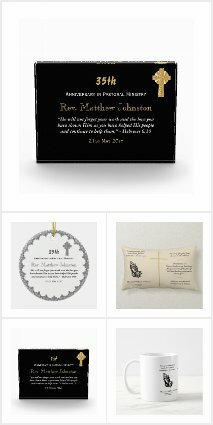 The Priest Gifts featured on this page can in many cases be customized by changing the text or you can add a photo. In some cases you can also replace the photo /image with one of your own and change the background colors. You can edit the text to include the Priest's name, date of ordination, number of years ordained and so on. Also featured here are more generic religious Christianity themed gifts including books, plaques and more. Personalized Rosary bead boxes are very popular as a Priest Gift. If you have any ideas for other Roman Catholic, religious life gifts for clergy for occasions such as a thank you, anniversary, newly ordained, Christmas, birthday drop me a line here.